As the country’s bonafide Sunshine State, Florida is the perfect destination for a family vacation. From the warm weather to the beautiful beaches, Florida has something for all ages. And although the thought of traveling with small children can sometimes sound more like a chore than an actual vacation, it doesn’t have to be! Many Florida resorts offer all-inclusive, family-friendly packages that are perfect for families with small children. So, although lots of preparation, packing, and forethought are required, rest and relaxation can be part of the plan. Most family-friendly resorts offer babysitting, child-friendly, on-site activities, and healthy kid-friendly treats so you don’t have to worry about entertaining your crew 24/7. From poolside water slides to kid style entertainment, here are the top 10 places to stay with young kids in Florida. 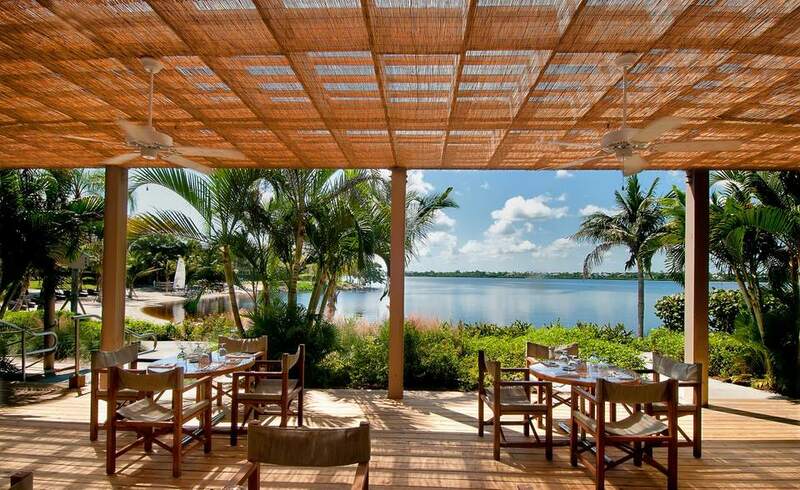 Located in Port St. Lucie, Florida, The Sandpiper Bay Resort is the only Club Med property in the United States. Pricing is all-inclusive and kids under age 4 stay free. The resort offers supervised children’s programs for all ages starting at four months old. Mealtimes will not be an ordeal at the resort’s child-friendly restaurants, and guests have 24-hour access to a baby care room equipped with bottle warmers, a microwave, fridge, mixer, and sterilizer. The resort also offers strollers on loan. Toddler activities available at the resort include a waterpark, baby gym, art studio, and fun kid-friendly fitness classes. Evening babysitting is also available if parents want to spend a night alone. Club Med Sandpiper Bay is not set on the ocean but rather on the banks of the St. Lucie River, so you can expect calm waters, most of the time. The resort boasts a 400-foot beach with sailing and other water sports, as well as a swimming pool. About 45 minutes north of Jacksonville, lies the beautiful and upscale beaches of Amelia Island. The Island’s Omni Amelia Island Plantation Resort is a great family destination for a low-key vacation. While there is no children's program for kids under age 4, this resort is a boon for nature lovers and wonderful to explore on foot or bike (with baby carriers, of course). The beach is lovely, and the pool area has a splash pad for little ones. Accommodation options range from standard hotel rooms to suites to condo-style units. Take in the Florida Panhandle at Splash! Resort in Panama City. This place was made for children of all ages and is super baby-friendly. Besides the beachfront location, the resort offers a wide range of fun activities for little ones including a toddler splash pad, lazy river, and covered waterpark area. All of the resort’s units look out onto the gulf and include a full-size kitchen, washer & dryer, and laundry detergent for when accidents happen. The resort’s reasonable room rates and downtown location make it a great all-around family destination. The Florida Keys are known for their laid-back feel and Island-style living, so if you’re looking for a low-key getaway, this is a great place to visit. The Ocean Key Resort & Spa is located right in the middle of Old Town Key West and sits directly on the water. Poolside cabanas are available for keeping little ones out of the sun, and high chairs and Pack-and-Plays are available upon request. There is no childcare available at the resort, but its proximity to some great toddler attractions like the Key West Aquarium and the Conch Train Tours will keep your child entertained all day long. Clearwater, Fla., tends to fly under the radar of many, but this peaceful, old-fashioned town shouldn’t be underestimated. Its beautiful and calm beaches and outstanding weather make it a must-visit family destination. Located about 40 minutes west of Tampa, Clearwater defines Florida charm. The Hyatt Regency Resort offers loads of child-friendly perks including a gated kiddie pool and Camp Hyatt for kids ages 3-12. On the weekends, evening babysitting is available as well from 6-10 p.m.
"Loews loves kids," is what the hotel chain promotes and it's true! For the posh and modern parent, this is the place to stay. Situated on the beach, the newly renovated Loews hotel boasts a shaded sandpit, zero-entry pool, and SOBE Kids Club for ages 4-12. Baby-friendly amenities are also available upon request including children’s toys, cribs and Pack-and-Plays, baby bathtubs, foam corner bumpers, and electrical outlet guards, night lights, and Johnson & Johnson Baby kits. If the idea of Disney World is too overwhelming for your toddler, which is entirely understandable, this Orlando resort is a great option. Formerly the Nickelodeon Hotel, and loaded with lots of excellent on-site activities, the Holiday Inn Resort and Waterpark offers all you need to make your toddler’s dreams come true. The onsite waterpark is great for small children, with lots of little slides and splash zones for them to explore, and during holiday seasons, special activities, like magic shows and water games, are offered. You probably won’t even have to leave the resort with your little one, as plenty is going on here to excite them.